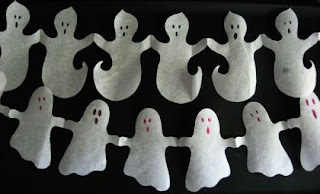 With less than two weeks until Halloween, I wanted to share some more simple crafts you can do with your kids to spookify your house before the big night. First up, hanging ghost lanterns from one of my favorite sites that you've probably seen me mention before, Skip To My Lou. 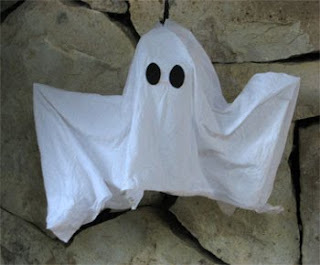 All you need for this creepy craft is some muslin (or an old white sheet), liquid starch, a soda bottle or other recycled item to build the base (you can even ball up aluminum foil), a wire hanger and black paint. 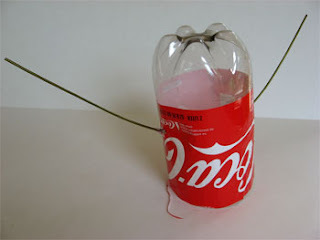 Make the base by taking your soda bottle or other piece of recycling and attach the wire hanger to either side to create a form for the ghost. Then dip the muslin into the liquid starch and drape it over your form. After it dries, remove the base, paint on a face and voila! 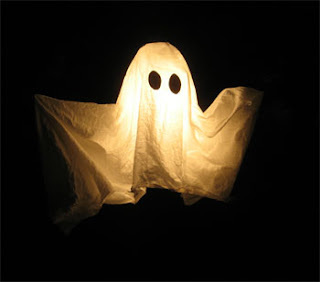 You have a great ghost to greet your guests. If you want to add a light, it can hang it as a lantern or you can simply put it out unlit as a table centerpiece. Either way, it will definitely get you in the Halloween spirit! For the full step-by-step instructions, visit Skip To My Lou. The next three projects come from the fantastic blog Alpha Mom. 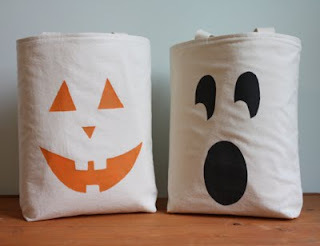 Want something cute and inexpensive for your kids to use while trick or treating? Then check out these Cereal Box Stencil Bags. Talk about simple! All you need is a fabric tote, some fabric paint, masking tape, a cereal box, an exacto knife and a sponge and you're ready to roll. First take off the back of the cereal box and cut out one of the freaky faces above using the template provided then tape the template to the box and let your kids sponge in the paint. Yes, it's that easy! Your little monsters will love creating a treat bag all their own. Get the full how to and the face templates on Alpha Mom. We've figured out what your kids will use to collect their candy but what about something to put the treats you're handing out in? 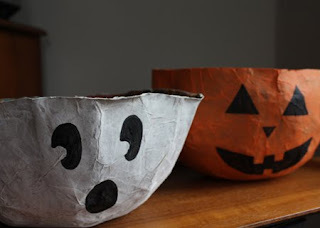 These Paper Bag Candy Bowls should do the trick! 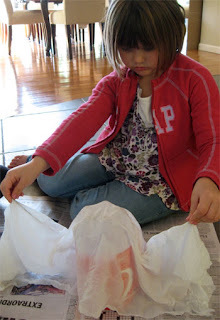 This project couldn't be any easier - take a bowl or Tupperware (this will be your form), lay it face down on a table and cover it with a plastic bag. 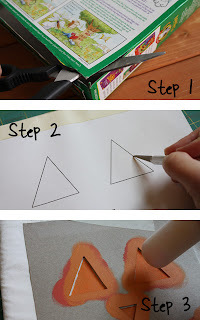 Combine one part white glue with one part water and dredge strips of a paper bag through it. Layer the glue-soaked strips over the form and let them dry for 24 hours. Once it's dry, brush the same glue concoction over the bowl and apply strips of tissue paper on top. Again, let it dry for 24 hours then remove the form, paint on a face and you're ready for Halloween! Want more details? Get them at Alpha Mom. And last but not least is the Ghost Garland. Remember making these back in the day with snowflakes? It's the same idea. 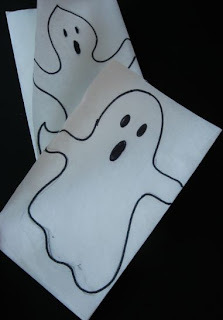 Take some tissue, butcher or freezer paper, fold it like an accordion and trace the template onto it. Cut through the layers, being careful not to cut the hands. Finally, let your kids draw on some faces and you're all set! 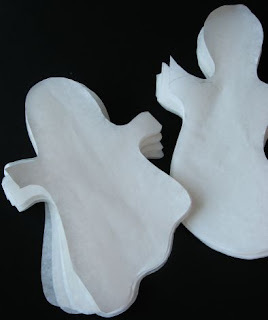 Get the ghost template and the full instructions at Alpha Mom and don't forget to check out the first installment of Easy Peasy Halloween Projects if you haven't already. INTRODUCING.... THE PICTURE OF THE WEEK! TO DIE FOR THURSDAY: It's Party Time, Part 2! FAVORITE WEBSITE WEDNESDAY: The Crafts Dept.